The treatment process includes fine solids removal and concentration of the remaining nutrients, resulting in a liquid concentrate and clean water. A strong stewardship ethic exists in the dairy industry, where farms often are passed down from generation to generation. When dairy farmers say they want to leave their land better for future generations, they are talking about their children and grandchildren, whom they hope will continue their legacy. Sustainability is not a new fad for these farmers. It is common sense to reuse everything and leave nothing to waste. Ask dairy farmers what one of their most costly issues is and they will say managing their manure. Ask them what one of their greatest worries is—other than milk prices—and they will say cost effectively managing manure in a sustainable and agronomic manner. These worries center on two aspects of manure management: long-term winter manure storage and later application to the crops. During the storage season, the slurry is mixed with precipitation and held in open-air tanks or lagoons. Many of America’s dairy-producing areas are in the northern half of the country, and as such receive significant amounts of precipitation. This precipitation adds volume to manure stored in the open tanks or lagoons. Building new storage facilities is costly, in the range of 11 to 14 cents per gal, or roughly a $500,000 for a 2,000-cow dairy farm producing 60,000 gal of manure daily. Once the ground thaws in spring and becomes absorbent, applying this large and dilute volume of manure to fields is costly. Because soil and crops can uptake only so much nutrient, farmers are forced to truck the heavy liquid manure to distant fields at costs of around 1.5 cents per gal. Treating wastewater has been commonplace for decades. Every municipality in America has a wastewater treatment system, as do industrial food producers and power generators. However, dairy farms have not been able to benefit to the same degree from those technologies. The reasons are both technological and economic. From a technical perspective, normal municipal treatment processes are designed to treat extremely high flows with dilute concentrations of nutrient to achieve high treatment reductions. Economically, such design parameters lead to high capital and operating costs that are offset by taxpayers or high value processed food sales. Conversely, dairy manure is much more concentrated, requiring necessary modifications to the technologies. Dairy capital asset acquisitions entail more upfront risk, too, because dairies cannot rely on financing underwritten by taxpayer dollars or produce a price-controlled essential commodity. The combination of these factors is creating a vicious cycle for family farms already at lagoon storage capacity or that have limited acreage to spread their manure, as market forces in the industry necessitate larger-scale operations, which in turn creates more manure to process. Members of the Regenis team with Coldstream Farm owner Galen Smith (second from left). This new technical approach designed for livestock manure solves these expensive and environmentally sensitive issues through a two-step process. The first stage receives manure that has had coarse solids removed via screw presses or screens, a common practice at all dairies. 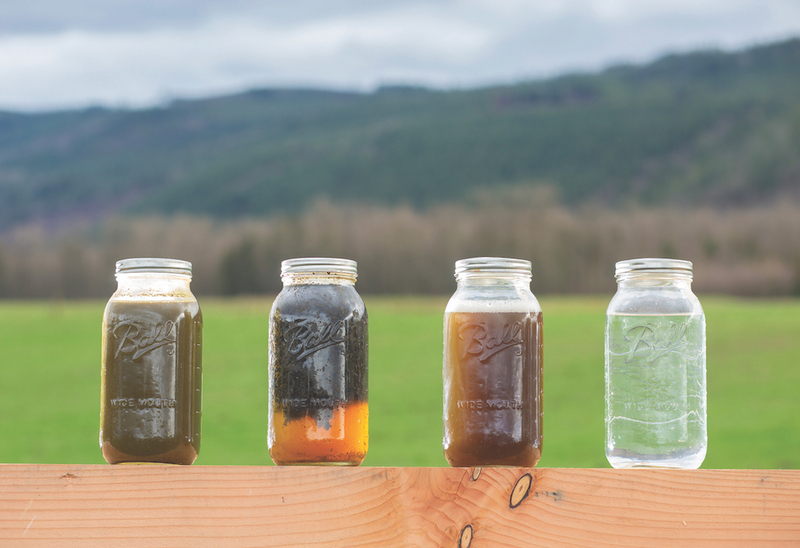 Upon receipt of this manure, the first stage goal is to remove the remaining fine or suspended solids through a flocculation process that uses polymer to bind fine solids into larger solids that can be separated from the liquid and dewatered. These fine solids are associated with nearly 30% to 40% of the nitrogen and 80% to 90% of the phosphorus, allowing this stage to concentrate these essential nutrients into a dense, solid form. In turn, this solid and its nutrients can be more economically transported to distant fields, reducing both the cost and the agronomic burden. The resulting liquid is reduced both in these critical nutrients and solids, producing a more clarified liquid, referred to as tea water. This thin tea water can be readily applied via irrigation systems, such as pivots, to local fields, again lowering costs and significantly reducing nutrient concentration. The first stage can be stand-alone, while a second stage further treats the tea water. The goal of the second stage is to use a series of pressure-driven membranes to further concentrate the remaining nutrients, ultimately leading to a liquid concentrate and clean water. Pressure-driven membranes work on the principle of pushing a dirty liquid through tiny pore-sized openings capable of blocking different nutrients and even bacteria and viruses. Particles of larger size than the pore opening are shunted out of the membrane, producing the concentrate, while particles of suitably small size continue, yielding the permeate or clean water. One of the keys to unlocking successful membrane treatment for particularly dirty liquids such as manure is to minimize the high salt-induced pressure gradient between the inlets and outlets of the membranes. Like your eardrum on a descending aircraft, pressure differential causes undue stress on the system, eventually leading to costly membrane failure. The Regenis Even Flow approach uses a particular sequencing of nanofiltration and reverse osmosis membranes to reduce and control salt-induced pressure gradients, and as a result generates highly purified water. The Coldstream Farm system will generate a projected 4.3 million gal of freshwater over the next year. Coldstream Farms is a second-generation family dairy located in Whatcom County, Wash., with 1,650 mature milking cows and 1,374 acres of owned and rented land near the South Fork of the Nooksack River. The valley averages 61 in. of precipitation per year, the majority of which occurs during winter months. Paradoxically, low water flows in local streams during the summer are a significant concern and have caused heightened tensions between farmers, landowners, homebuilders, environmentalists and tribal governments. Local building codes require a 100-year water supply, stifling growth in an exurban area where young couples and seniors often move looking for more affordable home prices. Federal regulations in place to ensure adequate stream flows for endangered salmon runs compound the problem. As a result, the local public utility district, which oversees the area’s water management, has been eager to find additional water resources. Coincidentally, Coldstream Farm has a desire to remove excess wastewater from its system. The confluence of a win-win for water users was in sight. Regenis, its partners at the Whatcom Public Utility District No. 1, and the owner of Coldstream Farm, Galen Smith, submitted a grant application to the Washington State Clean Energy Fund in late 2017 to underwrite a significant portion of the system. The Washington State Conservation Commission approved the grant in June 2018. Launched in October 2018, the system was designed to operate around the clock to treat 22,000 gal of manure daily, but could eventually be expanded to process the entirety of Coldstream Farms 60,000-gal capacity. The FSS/Even Flow clean water system will release a projected 4.3 million gal of freshwater back into the Nooksack River over the next year. Beyond the clean water, the system will create nearly 3 million gal of nitrogen and potassium-rich concentrate. Nothing from the daily 22,000 gal of manure is left to waste because even the phosphorous captured in the fine solid separation system can be used or sold as a solid organic nutrient. Coldstream offsets its upfront capital costs by comparing them to yearly savings related to pumping and hauling manure. Worth noting also are significant savings from avoiding the cost of renting more acreage or having to permit and build a new lagoon storage tank estimated at $550,000 to hold 5 million gal of manure. Currently, Coldstream is at 93% of its lagoon capacity in an average rainfall year. With the clean water system treating 22,000 gal of manure daily, Coldstream’s storage needs are reduced by 20%. The upshot of removing nearly 4.3 million gal of manure from its storage facilities is that the dairy now has the ability to expand its herd by as much as 341 milking cows without having to invest in new storage or purchase additional water rights, a significant factor in improving the farm’s long-term economic prospects. Revenue sharing from water with neighboring farms or local utilities. There are a host of non-quantifiable benefits for farmers, such as reduced phosphorus loading of the soil, less soil compaction, better agronomic timing and a reduction of greenhouse gas emissions. Farms needing new sources of fresh drinking water, especially in states facing drought restrictions.